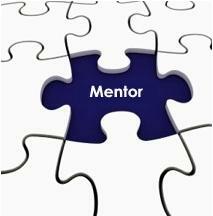 I’ve had a few great mentors in my past and hopefully I have a few people that would consider me as their mentor. This entry was posted in Lifestyle Freedom and tagged 2 hour appreneur, becoming a mentor, building a business, mentor, mentorship, software business on December 22, 2014 by Steve Miller. In my prior posts, I’ve discussed my journey to develop an iPhone app and I have documented the things I’ve done along the way. This is a continuation of that series of posts. Today we will discuss test preparation tasks you can begin doing as your app is being developed. Post 1 – Build an app working 2 hours a day? Post 2 – What App Should I Build? Post 4 – Is Your App Idea Financially Viable? Post 5 – How Will You Monetize Your App? If you’ve followed my advice thus far, you have outsourced the development of your app so that you can spend time planning the marketing effort. However, one of the most critical things you can do while your programmer is developing your app is to begin to prepare for the testing effort you will go through once the programmer sends you the first version of your app. If you wait until you get the first version of your app, you will be scrambling to figure out what tests to run. The best approach is to create a list of test cases you can run — but do this as development is going on. This approach allows you to flow right into testing the day you get your first build. In a prior post, I discussed how to get the best price for your app development. As part of this, I discussed creating a detail specification in RFP format so that the developer will fully understand your requirements. Taking this approach also aids in your test case development because when you begin developing your test cases, you can simply go through each section of your RFP to jog your memory about test cases you need to run. 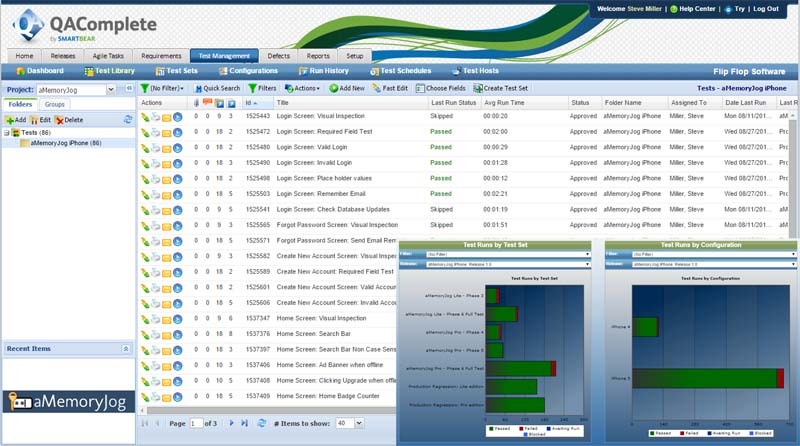 In your first cut, you will want to simply make a list of test cases without the detailed steps to execute each one. For aMemoryJog, here are some of the initial test cases I created. This is a very abbreviated list of test case (I have about 90 test cases so this is just a few of them). Notice that I have test cases for each screen within the app. So for the login screen, I first inspect the look and feel of the screen to ensure that it matches the design specified in the RFP. 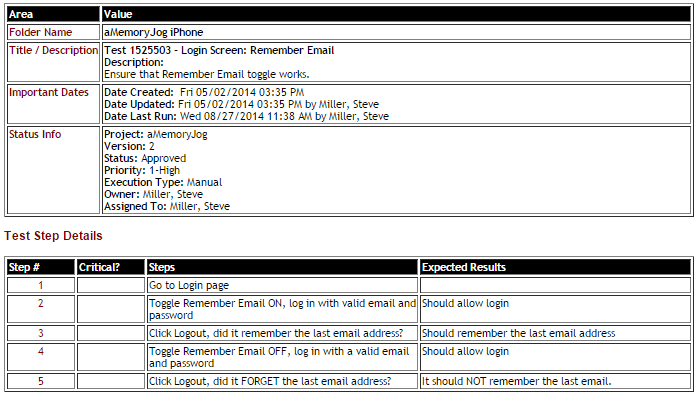 Then I have a test to ensure that all of the required fields must be entered before going forward. For example, if they want to login, they must enter both their email address and password to login and if they don’t, it should alert them of that. 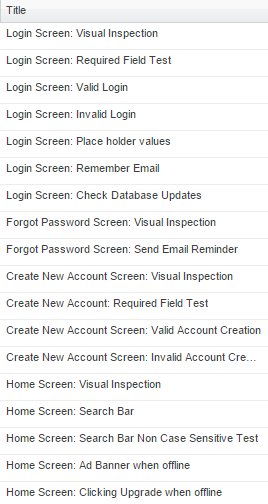 Then I move on to testing for a valid login and an invalid login (incorrect email address and password). Once you have created a list of test cases you wish to run, go back and add the steps you must go through to run each test. Why go through this? Well first of all, it makes testing mindless. You don’t have to try to remember how to execute a specific function, it has already been documented. Another reason is that one day (once you are successful), you will probably outsource your testing effort and having detailed test cases makes that process easy. Where Should I Keep My Test Cases? Once you have working capital, I suggest you use a test management system. I use QAComplete from SmartBear Software because it allows you to create test libraries, test sets and has some really good reporting capabilities that show you the status of your testing effort. It also allows you to track bugs (defects) so that you can communicate them with your development team and track their fix status. If you don’t have any working capital up front, I suggest you use Zendesk for defect tracking since it is free. Take the time to plan your testing effort while your programmer is coding your app. Don’t spring for a test management system until you have some working capital but purchase it as soon as the business can support it. The app I am creating is slated for production in the App Store in November 2014. However, the web edition is already available at http://www.aMemoryJog.com. 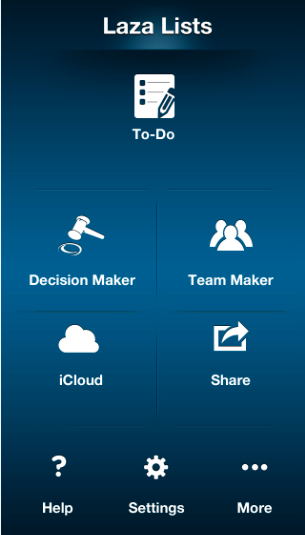 Once the app is done, it will seamlessly sync with the web version. This entry was posted in App Development and tagged 2 hour appreneur, 2hourapprenur, appreneur, building a business, how to start a mobile app business, mobile app, mobile apps, qacomplete, small business, smartbear-software, software business, test-case-development, tracking-test-cases, using-a-spreadsheet-to-track-test-cases, using-qacomplete-for-test-case-management, using-zendesk-for-defect-tracking, zendesk on October 31, 2014 by Steve Miller. 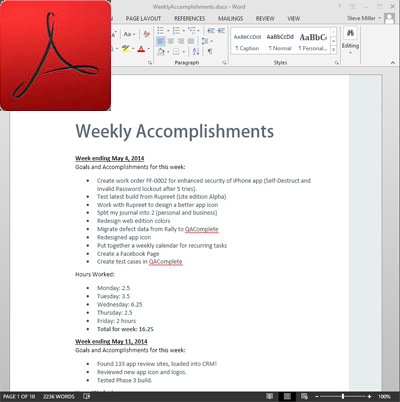 In last month’s post, I discussed how to keep track of your appreneur tasks and time spent. This month I thought I would take a break from the typical posts regarding how to build and run an appreneur business and let you know about the latest happenings with our app, aMemoryJog. We were just about ready to launch the aMemoryJog app and took a 2 month pause. Why? Initially we were going to have 2 apps, a free one (aMemoryJog Lite) and a paid one (aMemoryJog Pro). After reviewing other apps in the App Store, we decided to move forward with a single app (just called aMemoryJog). It will be free but will offer an in-app purchase that will unlock some additional capabilities (this is called a Freemium approach). The reason for this decision was that it will be easier to maintain and market a single app than it will if we have 2 separate editions of the app and the customer will have a much better experience if they decide to unlock the additional features with an in-app purchase. If they upgrade using the in-app purchase, the features will immediately appear and they will not have to download a separate app. If you want to learn more about the app, check out the aMemoryJog iPhone App website. 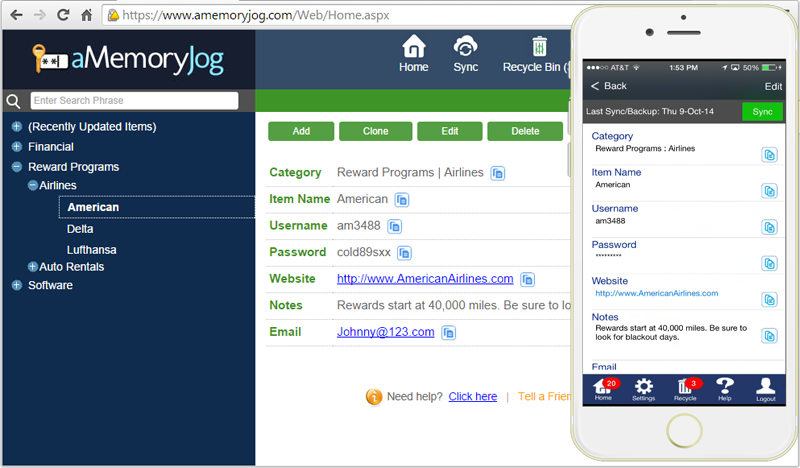 As the developer was redesigning the app, we took this time to also redesign the entire aMemoryJog website. The new site is easier to read, has more images, and is more search engine optimization (SEO) friendly than the original site. Below is the new look, but you can see the entire site here: http://www.aMemoryJog.com. When will it be in the Apple App Store? We hope to have the app in the Apple App Store by early to mid-November, assuming we don’t hit any snags. As you may remember, the web edition is already in production and a free trial can be downloaded here. This entry was posted in App Development and tagged 2 hour appreneur, 2hourapprenur, aMemoryJog Password Manager, appreneur, Basic features of aMemoryJog App, Best Password Management, Best Password Manager, Best Password Manager App, Best Password Manager for iPhone, building a business, ica sample, mobile app, mobile apps, Premium features of aMemoryJog app, small business, software business on October 15, 2014 by Steve Miller. 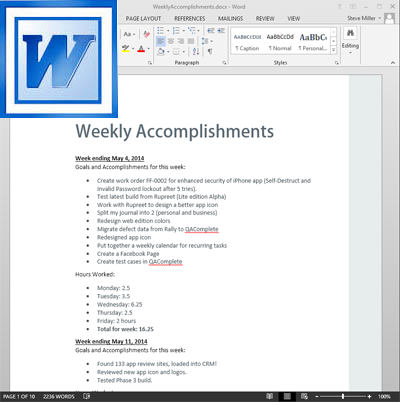 In my prior post, I discussed how to create a business plan for developing a mobile app. Once your business plan is complete and you have determined that your mobile app idea is viable, it is time to get bids from subcontractors for developing your app. But how do you get the best price possible? Is cheapest always the best? All of these questions will be answered in this blog. Imagine building a house without architectural plans. You might tell your builder “I want a small house with 3 bedrooms, 2 bathrooms, and a nice kitchen”. That type of house might cost $100,000 or it could cost $1,000,000. It all depends on the finishes, the builder you choose, etc. A $100,000 house might have carpeting, no fireplace, laminate counters instead of granite, a single sink in your bathroom instead of dual sinks, and may be built as a rectangle, without any interesting exterior features. A $1,000,000 home would most likely include hardwood floors, granite countertops in the kitchen and bathrooms, high-end appliances, indoor and outdoor fireplaces, incredible landscaping, a theater room, a home audio system that runs throughout the house, a pool and deck in the backyard, and a 2 story plan with a turret and other interesting design elements. To get a more accurate cost, you must be very specific in what you want so that few assumptions are made. Software is very similar, you need a plan (called a Specification) that details what the app might look like, all of the screens associated with the app, and what you expect the app to do on each screen. Without a specification, a developer cannot reliably provide you with an estimated cost because they cannot nail down exactly how much time it will take to complete it. In fact, without a solid specification, few developers will provide you with a fixed price bid — they will want you to pay them by the hour — and this is not good for you because you are never sure of how much the app will cost to build. And they are correct — without a specification, you could change your mind a thousand times as you begin development which adds a lot of rework and unnecessary costs. 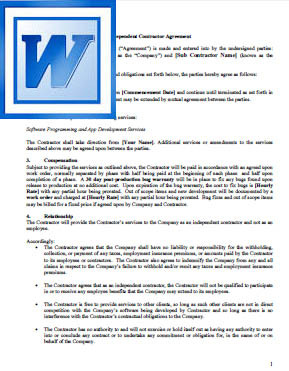 You can find a subcontractor from oDesk (http://www.oDesk.com). oDesk is free to use but once you choose a subcontractor, they will charge you a 10% fee. We currently offer a web based application called aMemoryJog (http://www.aMemoryJog.com) and would like to subcontract the development of an iPhone edition using Xamarin, C#, SQL Lite and SQLCipher. 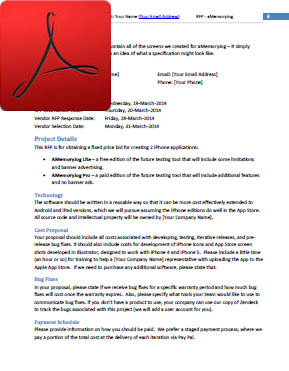 The work is for creating 2 iPhone apps, a free edition and a paid edition. We have created a very detailed specification complete with a database design, wireframes, and details of how each screen is to work. Part of the work is to also implement a web services component using Visual Studio 2012 (C#) that allows syncing data between the iPhone app and our web edition. Knowing the complexity of what I was asking to have built, I put an initial budget amount of $5,000 (fixed price). Once I submitted that, I was able to search oDesk for qualified subcontractors and ask them to consider bidding. I always try to hire a freelance programmer rather than an agency because an agency has overhead costs that a freelancer does not have, so a freelancer is normally less expensive. Once I submitted my job posting, I began getting emails from subcontractors saying that they were interested. 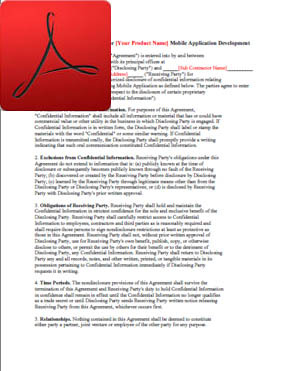 I would reply to them with the NDA document and ask them to sign it before sending them the detailed RFP. Once I received their signed NDA, I sent them the RFP and asked for a fixed price bid. After a few days, I began getting bids. Bids ranged from $4,000 to $17,000 — but most averaged $6,000. I did not choose the cheapest subcontractor; I based my decision on how thorough the response was and how well they answered my questions. The subcontractor I chose provided me with a fixed price estimate, a detailed response on how he would develop the app, the milestone dates associated with the development, and provided me with examples of his past work and references I could contact to get comfortable with his work. 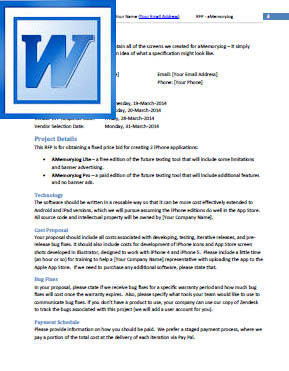 Now we know how to get the best price from a subcontractor for our app development project. My next blog will be out in a couple of weeks — I will discuss what marketing tasks you can be doing as your app is being developed by your subcontractor. The app I am creating is slated for production in the App Store around July or August 2014. However, the web edition is already available at http://www.aMemoryJog.com. Once the app is done, it will seamlessly sync with the web version. This entry was posted in App Development and tagged 2 hour appreneur, 2hourapprenur, app legal protection, appreneur, balsamiq mockups for app development, building a business, cost of developing apps, costs associated with app development, creating a prototype using balsamiq mockups, fixed price app development, getting the best bid from an odesk freelancer, how to choose a subcontractor for app development, how to start a mobile app business, ica sample, independent contractor agreement sample, mobile app, mobile apps, nda, nda sample, non disclosure agreement sample, request for proposal sample, rfp sample, small business, software business, using odesk on July 25, 2014 by Steve Miller. In prior posts, I discussed many of the things to consider when developing a business plan for starting an #appreneur business. 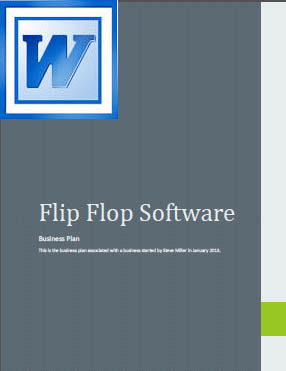 It is now time to put the finishing touches on the business plan. Build a mobile app business working 2 hours a day? What app should I build? Is your app idea financially viable? How will you monetize your app? Before committing money to any business, it is important to create a business plan. When doing this, don’t wear rose colored glasses. Too many people come up with an idea and convince themselves that it is a good idea without any objective analysis. If they do commit to doing a business plan, they skew their analysis to support their idea that the business is viable instead of objectively analyzing competitors, attainable market share, and overhead costs. This is a great way to lose money. How Can We Reduce Risks of Losing Money? The best way to reduce the risks of losing money on a business venture is to go into the business planning with skepticism as to whether your business idea is worthy of investing in. Only after careful analysis of the market space, competitors and costs do you decide if the idea is worth investing in. If your analysis tells you that it is not financially viable — don’t waste your time and money! Go back to the drawing board and look for another idea that has reduced risks. If your idea does look like it has legs (is viable), commit a certain amount of funds towards it, based on your startup analysis. Then when you commit those funds, keep an eye on your expenses. If your revenue is not what you expected or if your costs greatly exceed your projections, define a monetary threshold you will not exceed and if you do — shut it down! Pouring tons of money on a bad idea is a great way to go broke! OK, now that I’ve scared the hell out of you, you probably figured out that I am really just describing how important the business planning process is. Skip it and you will most likely fail. Go into with a biased optimism can also cause you to fail. Go into it with open eyes and analyze everything you can so that you can make the best decision possible regarding the viability of your idea. In the past months, I’ve been feeding you blogs that described different parts of business planning. 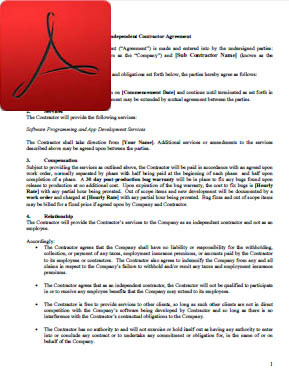 General Company Description – This contains your mission statement, goals and objective, business philosophy, user demographic, industry information, company strength/weaknesses, and legal form of ownership. 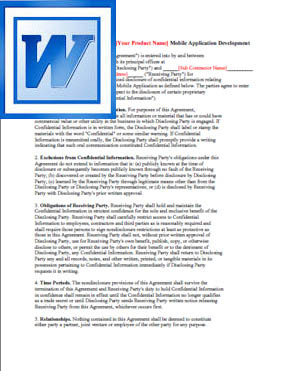 Products and Services – Describes your product /services offered. Marketing Plan – Describes your product features / benefits, customer profile, competitor revenue analysis, branding elements, the niche you are pursuing, marketing strategy, a description of the sales process and follow up, marketing budget, how you will price the product, a sales forecast for the first 2 years, and timelines. 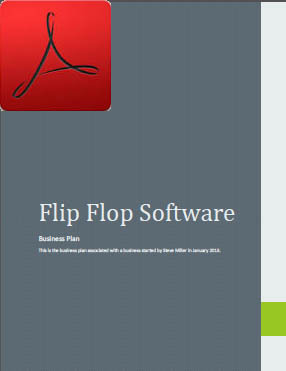 Operational Plan – Describes your production and maintenance plan, business location, legal environment, personnel plans, inventory process, accounting procedures, general marketing approach, competitive matrix, startup and expenses and capitalization. Now we have a very good understanding of how to analyze our business idea and to create a business plan to determine if it is viable. My next blog will be out in a couple of weeks — I will discuss how develop a specifications document that you can hand off to a consultant to get the best price for developing your app. This entry was posted in App Development and tagged 2 hour appreneur, analyzing your competitors, appreneur, building a business, business analytics, business plan, business plan example, business plan sample, competitive matrix, competitive sizing, cost of developing apps, costs associated with app development, defining a marketing plan, defining operational plans, defining products and services, estimating app revenue, Estimating Revenue for Apps, how to start a mobile app business, mobile app, mobile apps, small business, software business, tracking your competitors, Website Hosting on July 11, 2014 by Steve Miller. In our last post, we discussed how to determine you app’s user demographic using Alexa and how to refine your marketing strategy based on user demographic. Now it is time to flesh out the specific marketing activities we might plan for when preparing our app for the App Store. When I was building my last software business, our product sold for about $700 per user per year for our Software-as-a-Service model and about $1100 per user per year for our On-Premise edition. It was not unusual for a single client sale to yield $30,000 to $50,000 because a normal sale was for 30 to 50 users of the On-Premise edition. I had the sales and marketing side of things pretty well figured out. We would advertise with Google Adwords, sponsor trade shows, speak at events, appear in trade magazines, and perform weekly web-based demonstrations of the product to users that signed up for a trial. All of this was supported by an automated email drip system that emailed clients once they downloaded our product and a sales team that followed those emails up with a phone call to nudge the client to attend a demo and eventually purchase. App marketing is very different. Why? Because the price of apps normally range from 99 cents to 20 bucks. With such a low sales price, it would not be cost effective to have a sales team contact people that download the app to nudge them to buy. It would also not be feasible to try to demo the app to users weekly — it just does not fit for this type of product. When someone starts searching for an app, they will decide in matter of seconds whether they will download the app, normally based on the look of the icon, app screen shots, short description of the app and the user reviews. So it is important to get those things right. Additionally, the App Store is crowded with lots of apps so it is important to get your keywords right so that when someone searches for an app similar to yours, they find it. In addition to the App Store, you can also drive downloads for your app from other sources. Bloggers and journalists are normally held in high regard, so if they review and recommend your app, it is an easy gateway to gaining users. Based on my research, here are a list of marketing activities that make sense to consider for apps. Place your product in all app stores (Apple, Google, Windows) – start with Apple first and migrate to other platforms once a platform shows success. Use Google Adwords to drive downloads. For about $100 a month you can drive more downloads. Always tweak this process and measure the conversions to ensure that the money is well spent. For those of you reading this blog, it is part of my marketing strategy. The idea is to build a community of like-minded individuals and provide them with really useful content. When others take a journey with you, they are more likely to share your blog and product information with others — resulting in more visibility for your app. By the way — please tell all your friends about this blog and have them subscribe to it and my Twitter feed and Facebook page (thanks!). Spend time every day gaining new Twitter users for your blog — use Just Unfollow to follow and unfollow Twitter users. I try to link to at least 50 new Twitter users per day. Create a Facebook product for your blog or product and try to gain visibility to it. Work with journalists, app review sites and bloggers to get reviews posted for the app. In only about a month, I have found about 125 blog / review / journalist sites that may review my app once it is ready for the App Store. Once my app is ready, I will email each of them asking them to review it. If they post a review (especially if it is positive), it will generate more visibility. Implement an automatic drip email campaigns for trial users of the software to nudge them to purchase. I wrote my own automatic drip email system but you can purchase Mail Chimp or a similar program to do this. Solicit sites to link to your web site by looking at your competitor’s linkages and sending emails to the owners of the linking sites asking to link to you. You can see who links to your competitor’s site by using Alexa. Participate in discussion forums with other appreneurs to offer advice. This is good for newbie appreneurs and can also be very good for you — you will always learn something new. Never overtly pitch your products using this technique but include a link to your product’s website page and a tagline on each post. That gives visibility to your product, you will be surprised at how many people will see it and click to learn more. Work with other #appreneurs to offer a MORE section of your app where your can cross promote each other’s product. Be sure that the products you show in this section are good products and complementary to yours. As discussed in a prior blog, it is good to also include these as affiliate links, allowing you to earn money for those cross sells. Implement reminder screens that encourage your free users to upgrade to the paid version. 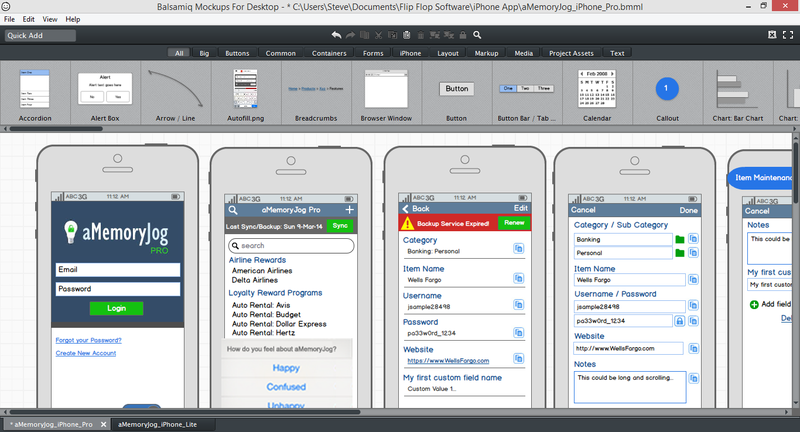 Continuously tweak the App Store listing by changing the product title, description and keywords with each release. Test the effectiveness of the changes. Localize the app title, description, keywords and screenshots for each language you support. Create a good press package for each release that includes a good press release, videos of the product, screenshots, product overviews, and features. If all above is working and you have extra marketing funds, advertise on Facebook. Now that you have a better grounding for the types of marketing activities you might want to implement, prioritize the list and get started! My next blog will be out in a couple of weeks — I will discuss how to finalize your business plan and give you the opportunity to see mine. Also, if you like this blog, please share it with others to increase our following. Our twitter account is @2HourAppreneur and be sure to like my Facebook page at http://www.Facebook.com/2HourAppreneur. Thanks for following the blog! This entry was posted in App Development and tagged 2 hour appreneur, alexa, angry bird user demographics, appreneur, building a business, business analytics, business plan, determining your app demographics, how to start a mobile app business, mobile app, mobile apps, small business, software business, using alexa for demographics on June 27, 2014 by Steve Miller. In our last post, we discussed how to monetize your app for free and paid apps. We even discussed how to generate recurring revenue from your app. Once you have figured out your monetization strategy, you will need to formulate a marketing strategy. A more refined marketing strategy can be created if you understand your user demographics. If you have really deep pockets, you can conduct user demographic studies that can better pin-point what type of “typical user” might enjoy your app. You can look at things like male / female, age, geographical location, and education level. But who has thousands of dollars to spend on these types of studies? Not me! There is an another approach. Using Alexa, you can put in your competitor’s website and it will spit out the demographic. After analyzing several of your competitors, you can hone in on your demographic. You will want to do that with 4 to 5 of your competitors to hone in on the commonalities. In some cases demographics can be very important. For example, women tend to use meditation apps more than men so if I were designing a meditation app, I would want very soothing colors and would want to give my beta version to several women I trust to try it out and give me feedback on the design, look and feel and functionality. The demographic can also play into how you market the app. In our fictional meditation app, I would scour the web for some female bloggers that are early adopters of technology, and are into meditation. I would contact them to get them excited about writing a review for the meditation app. Their popular blog could turn other women onto the app if they really enjoy your app, especially if they write enthusiastically about it. Now that you know how to use Alexa, try determining your app’s demographic! My next blog will be out in a couple of weeks — I will discuss what marketing activities you might consider when planning the release of your app. This entry was posted in App Development and tagged 2 hour appreneur, alexa, angry bird user demographics, appreneur, building a business, business analytics, business plan, determining your app demographics, how to start a mobile app business, mobile app, mobile apps, small business, software business, using alexa for demographics on June 13, 2014 by Steve Miller. In our last post, we discussed how to determine if the app you have been considering building would be financially viable. 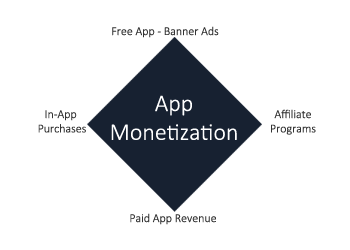 Once you have enough confidence that it is, it is now time to think out the options for monetizing your app. You could offer a free app that contains banner ads and each time someone clicks on a banner ad, you will accumulate money from those clicks. You could offer a paid app where each time someone pays for your app, you get 70% of the revenue generated (Apple or Google Play keeps 30%). You could provide in-app purchases that provide value added services (like data backups to the cloud, web access to your application, etc.). You could setup an affiliate program and present other apps as possible purchases within your app and receive a referral fee. What’s the Right Approach to App Monetization? So should create a free app with banner ads and in-app purchases, create a paid app, or just rely on affiliate program revenue? In my opinion, you should do all of the above to maximize your revenue. And you should figure out a way to capture recurring revenue. When creating my app, aMemoryJog, I am taking that approach. For those that don’t have the money to buy an app, I offer the free edition with banner ads. I feel that once they use the free edition for a while, it will be so useful that they will be willing to pay a small fee to migrate to the paid edition. Heck, at less than $10, it is probably less than the user spends at Starbucks in a couple of days of sipping lattes. But for those non-latte sipping types that never plan to buy, they will still have a cool app to use. And hopefully there will be occasions when they see a banner ad shown within my app that prompts them to tap on the ad to learn more. When they do, I earn ad commissions. 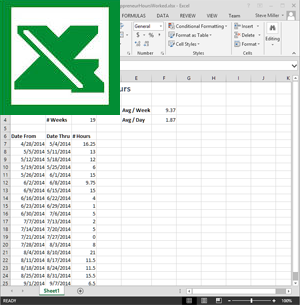 No Ads – No ads are shown in the paid edition, giving the user more room on the screen to see their data. Data backups to the Cloud – Each time the user makes changes on their phone, those changes are automatically sent to the cloud for safe keeping. 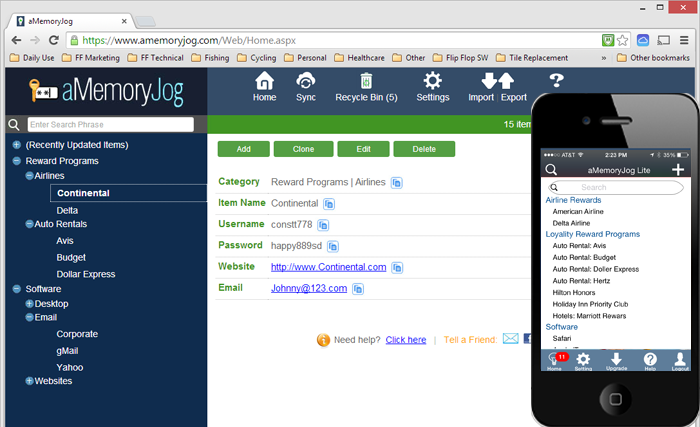 If their phone ever crashes or they have to restore it, they can easily restore their aMemoryJog data from the cloud. Free 1 Year Subscription to the Web Edition – When they purchase the app, it comes with a 1 year free subscription to the web edition of aMemoryJog. That means they can use it from their PC, Mac, tablet or any other device that has a web browser. Synchronizations with other Devices – Once they love the convenience of using the web edition of aMemoryJog from their PC, tablet or Mac computer, they will want any changes made there or on their phone to sync with each other. The paid edition does that — it seamlessly syncs all their devices. Remote Self Destruct – So what happens if someone steals your phone? Personally, I would like a way to remotely wipe out the aMemoryJog data from the phone without the thief knowing it. With the paid edition, you can do that. Just go into the web edition and tell it to self destruct the mobile device. It will wipe out the data when the thief tries to log into aMemoryJog on the mobile device but will keep it securely in the cloud in case you buy another phone and want to restore it so that you don’t lose all the data you kept in aMemoryJog. 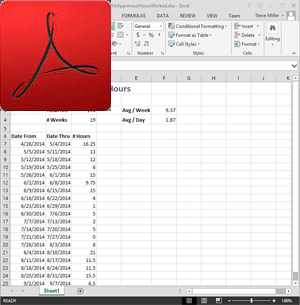 Recycle Bin – Another feature of the paid edition is the ability to restore a deleted record. Just like your Mac or PC, you can empty your recycle bin or restore selected items. Localized Languages – Finally, the paid edition allows a user in another country to use it in their native language. Whether that be Spanish, French, Italian, German, Russian, Chinese or Japanese — they are covered. I even added something special for English speakers — an option called English (Funny). When the language is set to that, it adds personality and attitude to each message that is displayed in the app. As you can see, I took a lot of care to provide very compelling reasons to upgrade to the paid edition. Most apps pay you once — when they download the paid software. Another way to generate revenue and ensure the longevity of your app is to add a recurring revenue component. In aMemoryJog, I provide a free 1 year subscription to the web edition of aMemoryJog when they purchase the paid edition. But after a year, they will lose access to the web edition and the automatic backups unless they renew their yearly subscription for $9.99. 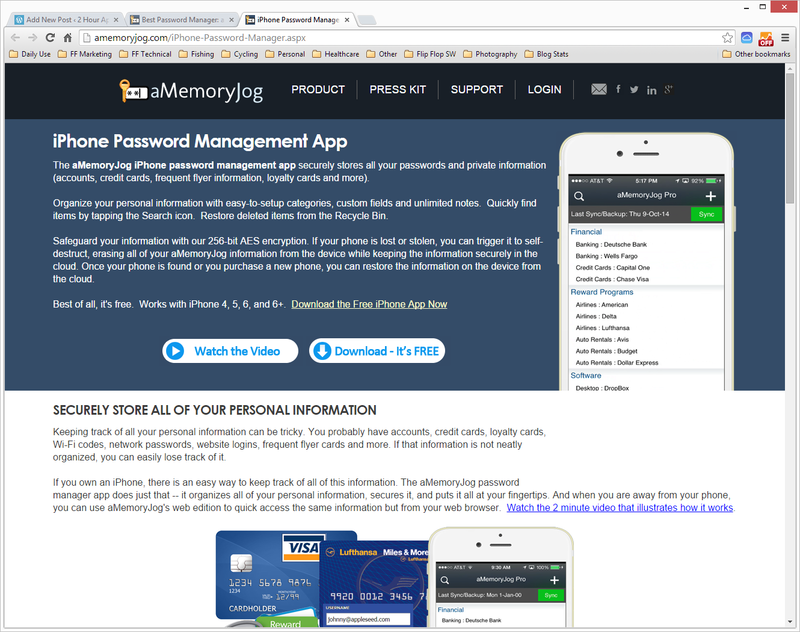 This is just good business because it is a very low yearly cost (less than a buck a month) but gives the user access to aMemoryJog from the web and keeps their data backups safe and secure in the cloud. I implemented it in a way where it keeps track of when their subscription expires then allows them to renew it from directly within the app via an in-app purchase. The idea behind an affiliate program is that you can present other people’s apps for download somewhere within your application and if someone downloads the app, you get a small commission from them downloading. Normally this is done by adding a MORE… section in your tab bar at the bottom of your app where people can click that and see other people’s app for download. It is important to partner with complimentary apps for this type of feature so that users of your app will want to download apps with a kindred spirit. 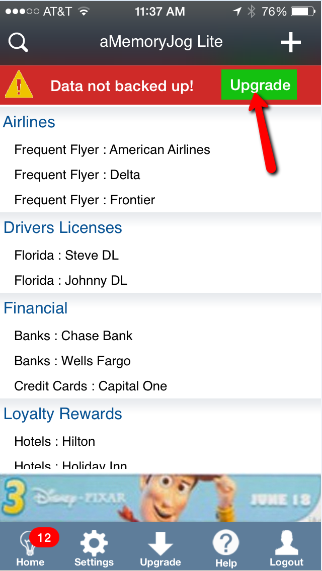 Even if you don’t decide to add a MORE… section to your app, you can still take advantage of an affiliate program. You can set your own paid product up as an affiliate and anytime someone clicks on the Upgrade button to download your paid edition, you get a small commission through the affiliate program — pretty cool, eh? We now have discussed different ways to make money with your app. My next blog will be out in a couple of weeks — I will discuss how to determine the demographic for your app (whether your users will be mostly male or female, college educated or not, etc). This entry was posted in App Development and tagged 2 hour appreneur, affiliate programs, app monetization, app monetization basics, App Website, appreneur, building a business, business analytics, business plan, estimating app revenue, Estimating Revenue for Apps, how to make money with apps, how to start a mobile app business, in-app purchases, making money with your apps, mobile app, mobile apps, paid vs free apps, recurring app revenue, small business, software business on May 30, 2014 by Steve Miller.